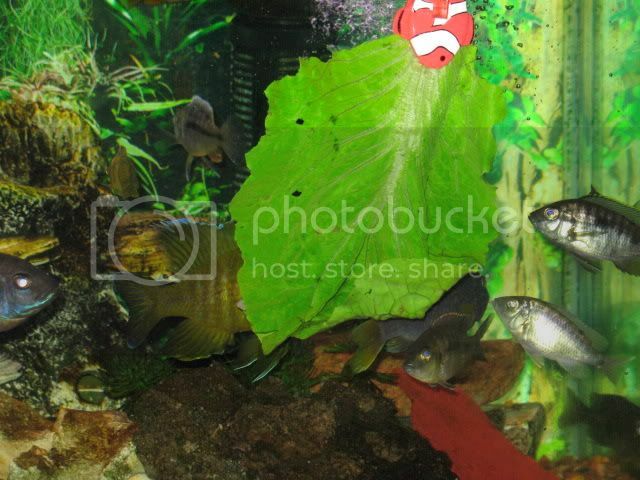 Discussion in 'Fish and Aquarium - all types' started by HDrydr, Mar 21, 2008.
besides the standard fish flake I used to feed mine blood worms and dried shrimp. Since dried shrimp in a can can be $$$ , I discovered that I could get a very large bag at a local Oriental food store. Which was a fraction of the price at the pet store. I fed them these for a number of years without any problems. I've since stopped doing this because the shrimp shells are usually spit out by the Cichlids causing the bottom to become more dirty after a long period of time. I have a 100 gal. and a 110 gal. with assorted africans. 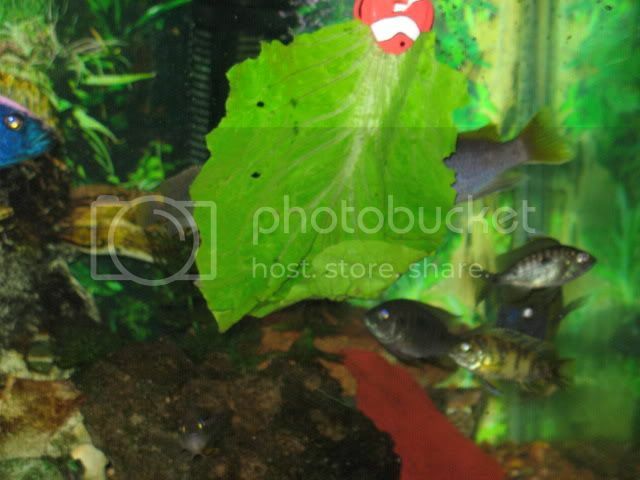 Mine love romaine lettuce, I hang a piece on a vege clamp inside their tank and it's like a feeding frenzy, lol! I also give them a treat of frozen brine shrimp once in awhile. Mostly I feed them pellets, food sticks, and vege flakes. I feed a variety of pellet foods, spriolina (sp), flake, frozen brine shrimp, cucumbers, zuc's but they love the cuc's more. Algae sheets are also a fav. I have found that I can't feed cuc's very often because my late pleco got a blockage must have gotten a little seed that I missed and he passed. Never tried romaine lettuce do you blanch it or just wash it and stick it in there?? I just wash a leaf of romaine lettuce and clip it to the inside tank wall with a vege clip. They all love it. Here's a couple of pictures of my peacocks eating romaine lettuce. Well I just tried the romaine lettuce in my tank of Africans and wow it looks like swiss romaine.... :mrgreen: I think that they liked it. I have a couple of African tanks, the 100gal. in the pictures and a 110 gal. I put the romaine in both tanks, and they really love it; by the time they get done, the lettuce stalk looks like a twig with some branches, nothing left of it!! I am going to try slicing and blanching some zucchini for them, too and see how they like it. I bought a couple of plecos for the 100 gal. and I heard they like the zucchini and romaine, too. Do you clamp the zucchini and cucumber on a vege clamp, or do you just let them drop to the bottom of the tank? Just curious, I've never feed them that before, I thought I would try it and see how they like that. That sounds like a good idea! I wasn't quite sure how to hold them in place, I will have to try something like that. Sorry about your pleco! I just bought a couple of them about a week ago in hopes to get rid of some brown algae in my tank. Thanks Nano "Rex" was a Bruno pleco and he was 7" or so long and beautiful!!! He owned the tank he could go anywhere he wanted even in the homes/caves of the dominant males!!! Nobody messed with him!! Oh well never thought it would happen....he loved cuc's!!! !